Trout really shines when paired with delicious lemon risotto and it’s slightly fatty skin and thin white flesh make it perfect for sautéing. Finish this dish with some fresh dill sprigs and lightly blanched spring vegetables. Be sure to save a little stock to stir into the risotto just before serving. This helps keep it extra creamy. The recipe makes six servings. Warm the stock in a large saucepan; cover and keep warm. Melt 1-1/2 tablespoons of butter with oil in heavy large saucepan over medium heat. Add shallots and sauté until tender, about 6 minutes. Add the rice and stir 2-3 minute. Add wine and stir until evaporated, about 30 seconds. Add 1-1/2 cups hot broth stirring frequently until absorbed. Add remaining broth 1/2 cup at a time, allowing broth to be absorbed before adding more and stirring frequently until rice is creamy and tender, about 35 minutes. Reserve last half cup of broth and keep warm. Stir in cheese and remaining 2 tablespoons butter. Stir in lemon juice, and lemon peel. Season risotto with salt and pepper. Cover and keep warm while cooking the trout. Just before serving, stir in the last 1/2 cup of broth so the risotto is creamy. Remove any bones from the trout with tweezers. Heat the butter and olive oil over medium-high heat in large saute pan. Sprinkle the trout with salt and pepper. When the butter/oil mixture is hot, add the fish skin-side down to the pan and cook for 3 to 4 minutes or golden brown. Using a fish spatula or other thin spatula turn the fish over and cook for another 3 minutes. 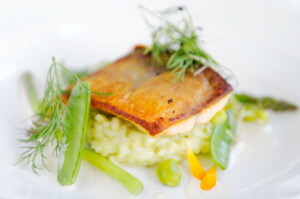 Remove from the pan and serve over the lemon risotto and top each fillet with 1/4 of the fresh lemon juice. Add fresh dill springs and blanched baby vegetables if desired.